Cooking a turkey for Thanksgiving can be challenging, even when you do manage to thaw it in time. Should you brine it? Cook the stuffing in the bird? And what does "resting" mean? Here are 10 tips to help you cook a terrifically tempting turkey. Once upon a time, deciding what kind of turkey to buy for Thanksgiving came down to whether to buy a large frozen turkey, a medium frozen turkey or a small frozen turkey. These days you have many more options. For starters, no longer are you limited to buying a frozen turkey. 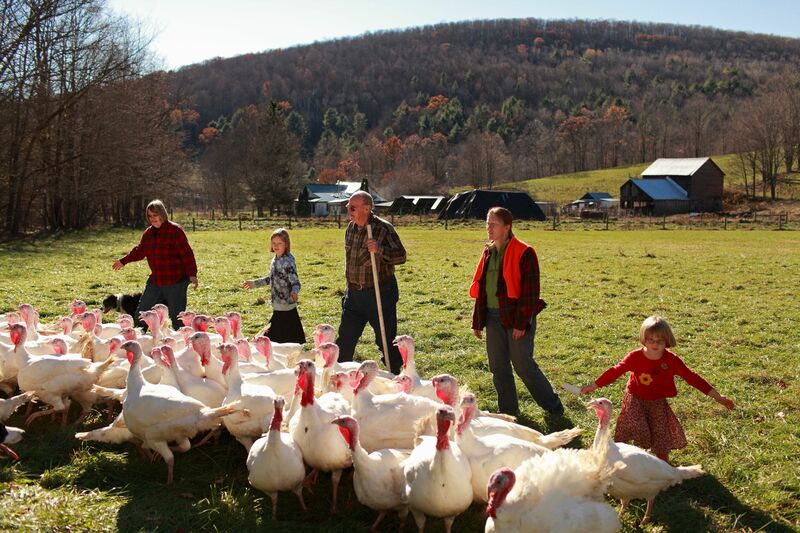 Moreover, you can now choose from organic turkeys, free-range turkeys, heritage turkeys, even Kosher turkeys. But what do all these terms mean? Here's a guide to help you choose the right turkey for you. As a general rule, 1 1/2 pounds of uncooked bird per person will ensure generous leftovers while factoring in varying appetites. For a truly plentiful feast, go ahead and bump it up to 2 pounds of bird per person. Two pounds per person is also about right if you're roasting a smaller (say 12 pounds and under) bird since these smaller turkeys sport a lower ratio of breast meat-to-bone. 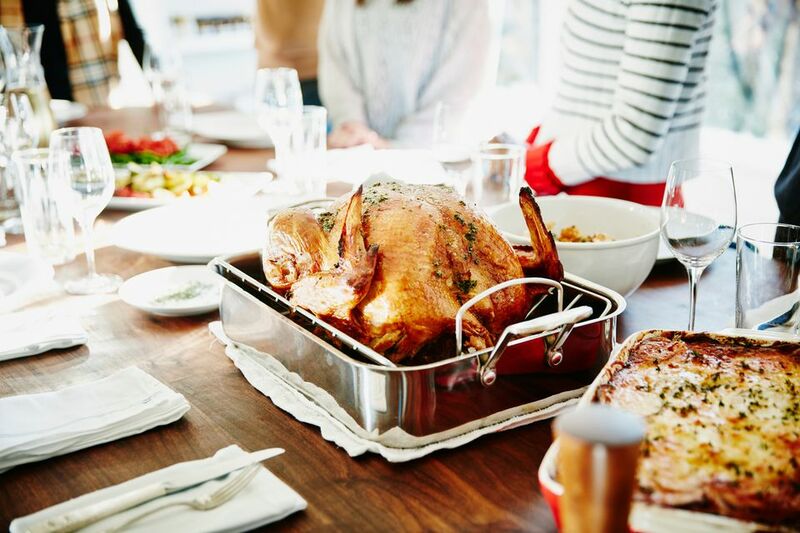 We've compiled this information, along with how much food you will need for side dishes, desserts, and even drinks, to help you plan your Thanksgiving feast. The safest and easiest way to thaw a turkey is in the fridge over a period of days. Allow 24 hours of refrigerator thawing per 4 to 5 pounds of bird. An 18-pound turkey would take about four days. In a pinch, you can thaw a turkey in a sink full of cold water. But this involves monitoring water temperature, changing the water multiple times, and effectively tying up your sink for up to 12 hours. In all likelihood, you'd be better off roasting it from a frozen state (which you can do and works surprisingly well). Roast your turkey uncovered in a 325 F oven, allowing around 15 minutes per pound. For a turkey in the 14 to 20-pound range, this will take 4 to 5 hours. The breast should be cooked to 165 F and the thigh to 180 F. By the time the thigh reaches 180 F, the breast will necessarily be much higher. But the key to remember is that 165 F is about food safety, whereas cooking the thigh to 180 F is so that the dark meat isn't chewy. If you're looking branch out, there are other ways to cook a turkey. Stuffing cooked in the bird might be traditional, but then it was also traditional to feel a bit queasy after Thanksgiving dinner. That's because cooking the stuffing in the turkey makes it harder to cook the turkey properly, and can also result in stuffing that isn't cooked through all the way either. Both of these create a food safety hazard. Here are some guidelines to help you cook your stuffing, and also figure out how much you need. Failing to cook the turkey (or the stuffing) properly isn't the only way to cause a case of Thanksgiving food poisoning. Anytime you're handling raw poultry; you run the risk of transferring dangerous bacteria from uncooked poultry juices, via your hands, your utensils or your cutting board. That's called cross-contamination, and it's one of the most common ways of transmitting pathogens like salmonella or E. coli. Practices such as safe thawing, not rinsing the bird, even something as simple as washing your hands, can go a long way toward ensuring that your Thanksgiving dinner is safe as well as delicious. Seasoning your turkey with salt and pepper, spice blends, dry rubs and the like is all well and good, but they do little more than season the skin, not the meat. The only way to effectively add flavor to the meat itself is to soak it in a flavorful liquid, called a brine, or by injecting the liquid directly into the meat (you'll need a special tool for this). The simplest brine is water with salt and sugar dissolved in it. But there are a zillion brine recipes you can try, featuring a wide variety of herbs, spices, fruit, even pineapple, and maple syrup. Trussing poultry is all about folding the legs and wings tightly into the body. The compact shape ostensibly encourages uniform cooking. But a turkey is not uniform. It's made of white meat and dark meat. Dark meat (i.e., legs and thighs) takes longer to cook, and is situated deeper within the body. Trussing folds the legs together, making it harder for heat to penetrate them. Consequently, your turkey takes longer to cook, and the breasts end up dry and overcooked. If the drumstick ends and wing tips start to get too dark, wrap them in foil. Other than that, don't bother with trussing. By meat thermometer, we do not mean an instant-read thermometer. A meat thermometer is one that you leave in the meat or poultry during roasting. Old-school meat thermometers feature a large dial that displays the temperature. Digital ones feature an alarm to alert you when your item reaches its target temperature. Insert the thermometer probe into the deepest part of the thigh, being careful not to hit bone. When the thigh temperature reads around 170 F, you can remove the turkey from the oven. Too often, cooks carve right into their turkey as soon as they take it out of the oven. Unfortunately, this causes the turkey's juices to gush out onto the cutting board, which is the last thing you want. If the juices are on the cutting board, they aren't in the turkey. Happily, there's a way to ensure those juices stay in the turkey when you carve it. All you have to do is wait at least 30 minutes after taking it out of the oven before carving it. You can read more about resting your turkey (also your steaks and roasts), and how it works.